A participant inspects a tire during the 2015 America’s Best School Bus Inspection Skills & Training Competition in Kansas City. 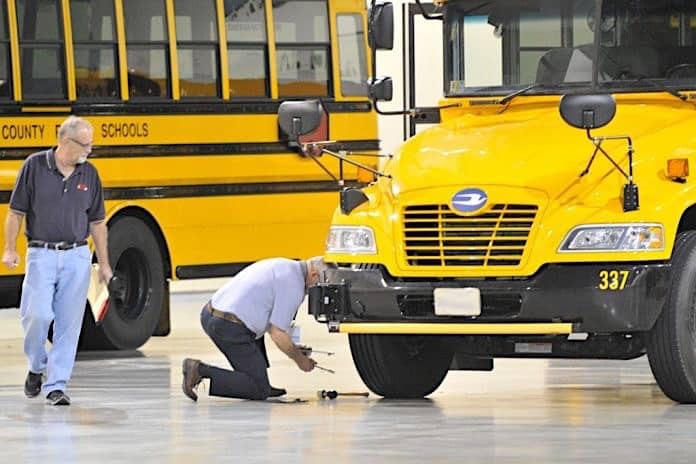 A first-ever workshop to bee presented on a national stage in June 2019, will provide details on improving the school bus inspection process, so the reliability of vehicles on the road can be increased. The National School Bus Inspection Training Program is one of a half-dozen Unique Experiences that are planned for the inaugural STN EXPO Indianapolis. All main conference registrants have the option to add the eight-hour training for an additional fee. The training, which was developed by school bus maintenance and inspection consultant Marshall Casey, is designed to surpass the minimum requirements of the Federal Motor Carrier Safety Administration and state departments of transportation. The class is scheduled for Saturday, June 8, at the JW Marriott in downtown Indianapolis and has a maximum capacity of 50 attendees. The Early Bird registration rate is $149, which expires on May 10. The price then increases to $199 per person. Note: The school bus inspection training is also being offered at STN EXPO Reno on July 27. All attendees will receive a handbook that covers repair and out-of-service criteria for inside and outside the bus; the engine compartment and underneath the bus; an overview of Federal Motor Vehicle Safety Standards and definitions contained in the National School Bus Specifications & Procedures; vehicle inspection forms; and guidelines for inspecting brakes, electronics, glazing, handrails, mirrors and more. The program includes eight hours of classroom instruction, as well as a written exam, and has already been implemented in South Carolina and Georgia. Casey, the retired director of fleet services for the South Carolina Department of Education, has also consulted with many other states, including Alabama, Arkansas, Florida and Texas, to develop similar training programs for inspectors. Joining Casey as instructors are: Joe Scesny, the retired supervisor of school bus inspections at the New York State Department of Transportation, and school bus maintenance consultant Bobby Williams. Includes: access to the trade show ONLY. The fee does NOT include main conference workshops, general sessions and keynote sessions.